Today is the third annual Family Science Expo at my library, and I'll be running one of the staff-led activity stations from our craft room. What type of science will we do in there, you ask? We're doing simple chemistry by making milk planets--colorful, milky reactions that end up looking like gas giants! Watch the video below to find out how to do this simple activity yourself using some basic household materials. Hello, friends and fellow literacy warriors! 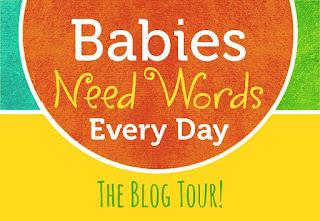 I'm pleased as punch to be participating in Day 1 of the Babies Need Words Every Day Blog Tour. In case you'd like a refresher, Babies Need Words Every Day is an ALSC initiative with the impetus to help libraries help families to reduce the 30 million word gap--that is, the massive gap in the number of words that a typical child from a lower socio-economic status (or SES) household hears as compared to a typical child in a higher SES*. And ALSC, with the hard work of their Early Childhood Programs & Services Committee, created 8 beautiful posters (in both English and Spanish) that cheerily invite parents with young children to engage in talking, reading, singing, and playing that will, as a result, facilitate a greater sharing of words with their children. It's my pleasure today to talk about one of the posters focused on "Talk." And boy am I happy to do so, because my favorite early literacy messages of all time--in storytimes, in parent engagement programs, and to early childhood educators--are about all of the amazing things we can help children accomplish simply by talking to and with them. When we talk to and with children, they hear and learn new words. They are introduced to new concepts. They become able to piece together facts that they understand separately to form a fuller picture of the world they inhabit. They become able to make analogies to understand both concrete and abstract concepts. And they develop the tools to express themselves. All such major milestones in literacy development. So when I talk to caregivers about the importance of talk, I emphasize talking for the sake of learning--conversation for the sake of concept-building. Parents, especially those with very young, pre-talking children, can feel awkward talking to their little ones. Many think it feels silly to chatter on with and ask questions of their infant, especially anywhere in public. But it's so beneficial! I am always emphasizing the simple, language-building ways that a parent can talk with their child. That's one reason why I love the koala poster you see here: it's got a simple, adaptable rhyme. 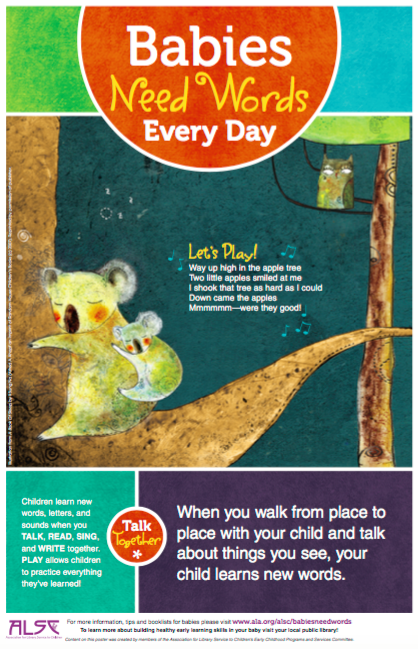 When a parent receives or sees this poster, they can learn the rhyme: "Way up high in the apple tree / Two little apples smiled at me / I shook that tree as hard as I could / Down came the apples / Mmmmmm--were they good!" That's a fun, simple rhyme to get a conversation started, say, at the grocery store. But it's also a template for more conversations. Substitute apples for your child's favorite food when you say the rhyme. Talk about things that grow on trees and where other foods come from. Talk about why things fall down. TALK! 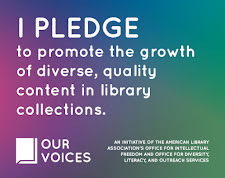 I encourage you to encourage the caregivers in your library and your community in the same ways. Print off the posters that you think will most appeal to your community (who wouldn't love the gorgeous artwork by Il Sung Na??). Hang them in your library, or hand them out at storytimes. At the very least, challenge yourself to have a conversation with caregivers about each of the practices emphasized by Babies Need Words Every Day. Families need library workers who know that babies need words every day. Be that library worker! 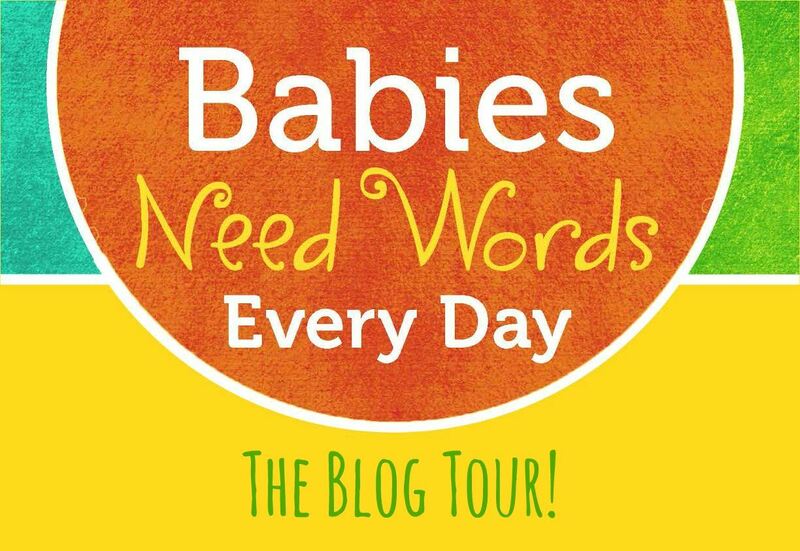 Check out all of the stops on the Babies Need Words Every Day Blog Tour for lots of resources and ideas. How do you talk about talk in your library? *Yes, it's true that bridging this gap alone will likely not completely solve all the problems--those 30 million fewer words are likely a correlation to a lower kindergarten readiness and reading achievement, not a causation. But study after study shows that efforts to increase early literacy through talking/vocabulary/background knowledge are, in fact, successful. The way I see it, Babies Need Words Every Day is an awfully impactful, low-effort tool to help us do just that. We have two-month program cycles at my library, and during each cycle, we aim to have formal, registered STEAM program opportunities for each of the age ranges in my purview as Youth & Family Program Coordinator--that is, preschool, early elementary (K-2nd), and older elementary (3rd-5th). When we can, the other youth programming staff and I like to tie in the themes and concepts in these age-specific programs to align with the theme in the BOOMbox, our STEAM space. The following program activity aligned with our recent Textiles rotation, where folks of all ages explore sewing, weaving, prints, dying, knitting, batik, and more. Once kids were settled into our craft room for the program, I encouraged kids to put on painting smocks in anticipation of the mess. Then I prompted them to look at the materials on the tables. What did they see? Could they identify the different fruits and vegetables? Could they make any guesses at what we'd be doing with the materials in front of them? After kids were clear that we'd be exploring print-making with paint and natural materials, we talked for a few minutes about what different shapes, patterns, and prints the different fruits and veg would make if painted and applied to the paper/fabric in different ways. I encouraged kids to pick up the veg pieces to look at them from different perspectives, trying to imagine the prints each side would make. We did this as a 45-minute program, and an integral part of using that full time frame was having multiple surfaces on which the kids could make prints. Everyone started off with a small sheet of paper to get a hang of the technique, then after maybe 10-15 minutes they each got a larger sheet of paper to plan out a larger, more intricate print (if they wanted). We talked about patterns and repetition, color choices, and other factors that print-makers consider at this point. Then, the final 15-20 minutes were spent with kids diligently creating a final print on a piece of muslin fabric. The idea was for the dried fabric to serve as a wall or door hanging, so we attached dowels with string to the top of each child's fabric so that the finished print could be displayed more easily. It was so interesting to me to see how different kids really connected with different aspects of this activity. Some were totally into color mixing, while others favored a consistent palate. Some wanted to get the full effect of a single veg or two from every angle (a sort of natural cubism), while others wanted to explore every single shape and texture available. By the end, one or two kids even started repurposing the veg as paintbrushes, using them to draw and write on their final prints. Simple activity, so many possibilities!